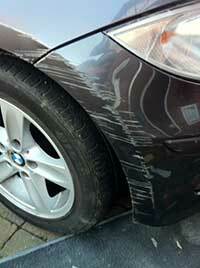 Smart Solutions is a car body and paint repair service covering Lymm and the surrounding areas. Our mobile repair service allows us to visit you at your home or place of work at your convenience. As well as our outstanding mobile on site paint repair service we can also collect your car for more serious damage or large area paint resprays which require the use of our fully equipped paint shop. We are competitively priced and ensure outstanding quality of work with every job. Our mobile repair service enable us to be around half the price of a normal car body shop with the same factory perfect paint finish.